Whimsybop: Collecting vintage Salt & Pepper shakers: Please pass the Salt! 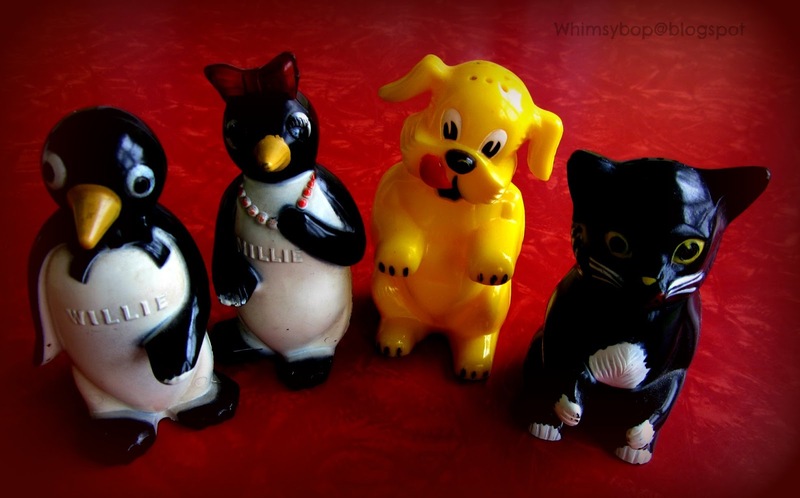 Collecting vintage Salt & Pepper shakers: Please pass the Salt! I guess I wouldn't be a collector of vintage junk if I didn't have at least one pair of salt & pepper shakers in the house now would I? 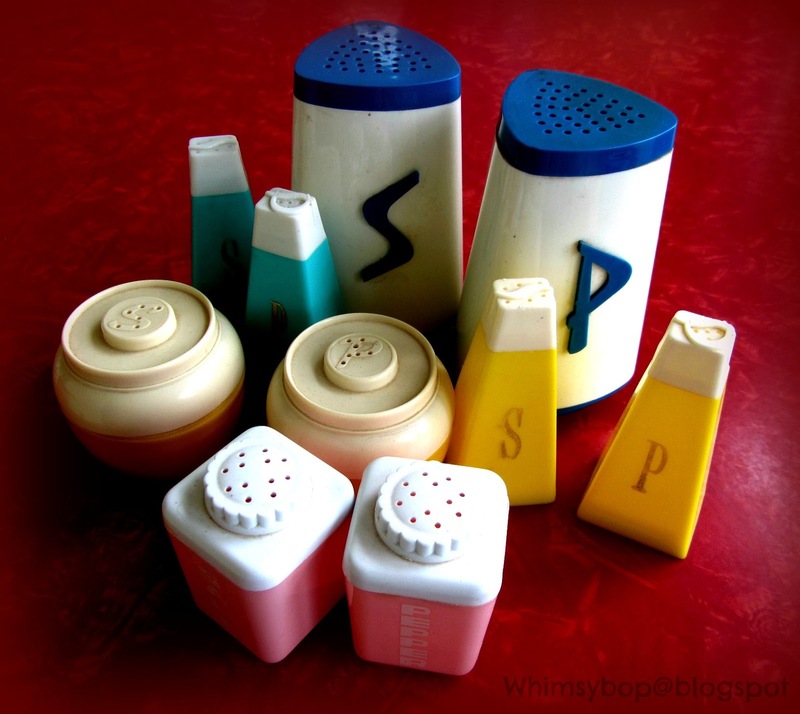 Unlike a "normal" person, however, I can't just stop at a couple of S&P shakers - no, I have to collect more than my share to feel as if I've truly tackled something! 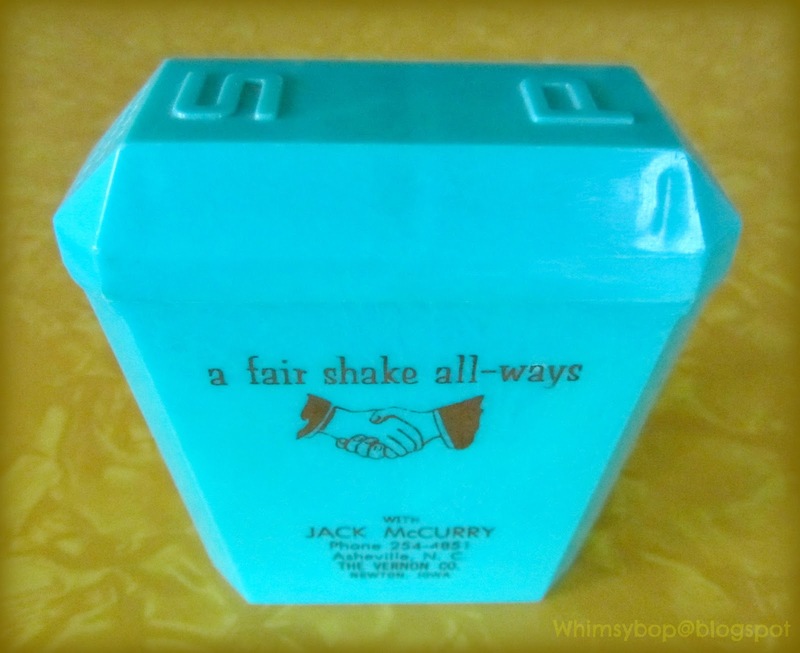 The first time that a salt & pepper shaker made me stop in my tracks was about twenty years ago when my friend Debbie and I were shopping at the Rose Bowl flea market in Pasadena, California. We were looking for good junk, good deals and hoping for a chance of catching a glimpse of a celebrity or two. 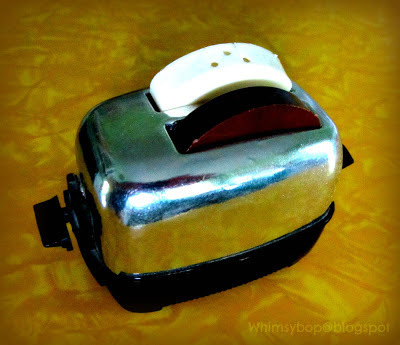 No celebrities that day, but I did stumble on the coolest thing EVER - a tiny chrome toaster with two cute little plastic slices of bread inside - the white slice for salt and the brown slice for pepper. It had a lever on the side which made the toast pop up or down; when in the "up" position, a slice could be removed in order to use it's contents. I couldn't resist - I laid down my $12 and it was all mine! 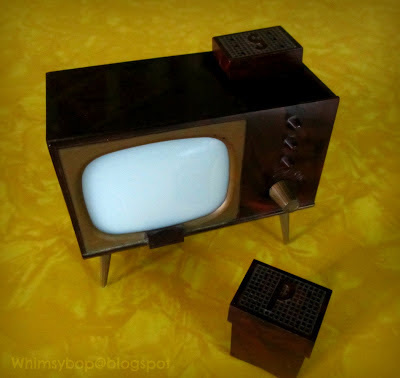 After our flea market fun was over, Deb and I found an antique mall on the way home where I happened on a salt & pepper shaker in the form of an adorable plastic television set. 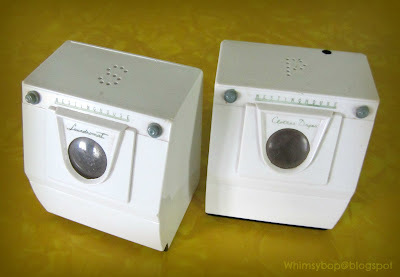 It was so cool with a little knob that turned to allow the S&P shakers to emerge from the console. For $10 it came home with me. Surprisingly, when I gave my husband the "show and tell" from my day's adventure later that evening he wasn't nearly as thrilled as I was (imagine that!). 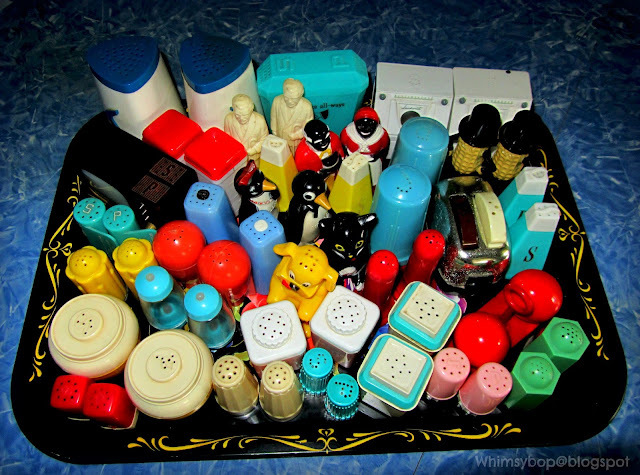 Since that day I have not been able to pass up a plastic salt & pepper shaker with movable parts; it is a day that my husband shall never forget. Thanks to flea markets, antique shops and e-bay I accrued quite a collection in the years that followed - and what I couldn't find on my own, my dear husband and a few generous friends presented to me in the form of birthday and Christmas gifts! After I had purchased about every movable salt & pepper shaker known to exist on the planet I began to broaden my search and collect S&P shakers bearing advertisements and marketing icons which led to collecting the S&P shakers bearing the groovy colors and funky shapes of the 1950's and 1960's. Once in a while I'll see a ceramic one that catches my eye but I quickly turn and walk away because if I know if I start on those - Yikes! There's no end! When my kids were little I let them take turns choosing a pair of salt & pepper shakers that the family would use during the month, which was lots of fun for them. It stopped being fun, however, after we moved a few times and had salt & pepper EVERYWHERE during the unpacking process (I wasn't efficient at emptying the shakers before they were packed), oops! Since moving into our present home four years ago, I'm sorry to admit that most of my collection has been hiding in storage. I have brought a few out to display on a tray to add a little color and whimsy to my kitchen. Because they are my worst dust collectors, I'm not ready to see the entire collection out just yet - not until I figure out a dust-free way to display them. In the mean time I have two little friends who are in elementary school who love to come over and dust my tray of S&P shakers to earn a little money - I don't know what I'd do without them (thanks JJ and Graysen!). 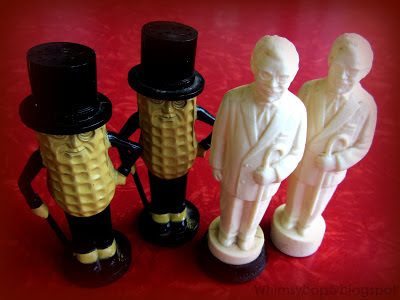 I find these vintage S&P shakers just about everywhere from yard sales to flea markets to antique malls. The prices range from 50 cents to about $40, depending of course on the condition and the design. My budget is around $10, although I'd spend a little more (but not too much) if I find a rare one that I don't have. I like having these S&P shakers around because they remind me of Jesus' words in Matthew 5:13: "You are the Salt of the Earth..." Salt does three very important things: it seasons, it preserves and it heals, reminding me and challenging me to keep my salt shaker full and to remain salty for my God! Display idea for you; use wooden pop crates hung on the wall or placed upon a bookcase to show off your S and P sets! Or your vintage spice tins.